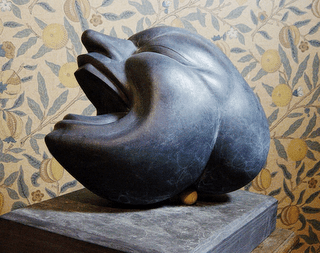 David Hensel, an English jeweller and sculptor, submitted a sculpture of a laughing head on a plinth to the Summer Exhibition of the Royal Academy earlier this year. When he went to the exhibition, only the plinth and bolster were on display. After he released news of the mistake to the press, RA spokespersons asserted that the plinth had been accepted for display, because it had merit, and the head rejected. While the Academy turned error into insult, Hensel has been publicly pondering what the mistake really says about the state of art and art criticism. I contacted him by e-mail and the following interview goes over the facts of the RA story, as Hensel recalls them, and looks at Hensel’s work. Williams: Let’s start by going over the facts of the Royal Academy (RA) incident. I have only read media reports on the internet. Sometime earlier this year you submitted a sculpture that consisted of a head, a plinth and a wooden bolster to the Royal Academy for its June 2006 Summer Exhibition. The RA has claimed, in the reports I read, that the plinth and bolster were submitted separately to the head. It’s not clear why that should be so. Were they in separate boxes? Was there one or two application forms? Did you receive an acceptance letter or acknowledgement of some kind? 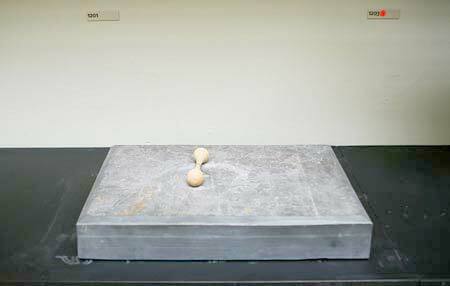 Eventually you went to see the exhibition and noticed that the plinth and bolster were exhibited without the head. What happened next? Did you speak to the curators? 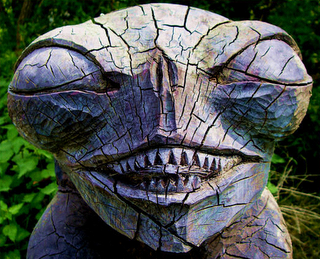 Was it you, or the RA, that notified the media of the circumstances about your sculpture? How did you, or they, do this? If it was the RA, did they show you the media release before sending it out? Hensel: In May 2006 I delivered to the Royal Academy a single sculpture which, as you say, consisted of a head, a plinth and wooden bolster. The bolster was tied to a loop in the plinth, and the head was loose. They were delivered as one submission: the entry form gave three copies of the same self adhesive barcode, one of which was stuck on the bottom of the plinth, one on a provided tie-on label which went in a rather ungainly manner round the head, and the third went on the entry form. It isn’t true that they were submitted separately: this idea was apparently devised by the self-protection department of the RA and issued broadly in a press release a few days after the start of the furore. I wasn’t consulted or shown it, it just appeared in some of the press. Most of the papers I saw that carried it also mentioned my more honest version. I recently asked the exhibition co-ordinator about this point, but she didn’t respond. I received an acceptance letter a few days before the show, after the whole selection process had taken place. This just said my sculpture, ‘One Day Closer to Paradise’, had been accepted for the show. I had found myself dissatisfied with the show, and becoming more and more depressed as I went round. I hadn’t found my sculpture yet, but that wasn’t the issue. The work from the Academicians seemed far more repetitive, old and tired, than usual. An RA member is allowed to enter six without selection. Everyone else, anyone else, can submit up to three pieces to go through the selection process. No problem with that—just the tedium. I don’t know if you know the annual show—it’s huge: one thousand items selected from ten thousand. Usually—I try to go every year—it is inspiring in it’s variation and the quality of the real among the fake among the routine. Why was it different this year? I have to go again and find out (but perhaps I’ll wait until my name is no longer dirt). As I went on round, there seemed to be more and more work that may be innovative or would-be subversive. Towards the end there were a lot of items by the famous Britart brigade [Hensel is referring to Damien Hirst, Sarah Lucas, Tracey Emin, etc. ], who it appears had been invited in to give the show a boost because the BBC were doing a three-part documentary and not because of artistic merit. I found my sculpture in the last room, on a pair of shelves like a store room. Or rather I didn’t find it. Only the plinth was there. OK, some people can discard a paper bag with such style that it’s almost art, and I agree that my plinth has some presence as an object, especially when viewed in light of the title. (I don’t know whether they saw the title but I’m assuming they did.) It is a monumental task mounting the show. I have huge respect for the organisers—the group of selectors—but there did seem to be rather a lot of dubious quality work there. And you should see the prize winners! On the way home in the train home I read a terrifyingly scathing article by Brain Sewell. He is usually acerbic, but this time I found I agreed with too much. Something wrong at the Royal Academy, connected with their attempted pose as ‘up to date’. The usual way to sell difficult work is to put it in the white gallery. —But put it, instead, in a context of scholarship, traditional values of excellence, and it doesn’t make it easier to understand. Anyway, Brian Sewell it turns out was a friend of my late brother in law. Too late. I told a number of my friends about my missing sculpture. Most just held their heads, some gleeful at the ammunition potential against the fat heads who run the art world. The laughter matches so well the range of expressions of the missing sculpture, including the horror that it has from one angle. I decided to try to contact Sewell to see if he wanted to follow it up. Also I got, from a friend who knows him, the e-mail address of David Lee, who writes a magazine full of unusually well-observed criticism called The Jackdaw. I tried to contact Sewell by e-mail through the Evening Standard, the London paper which had his article. I was thinking about it a lot, somewhat aggrieved but also fascinated, wondering whether it could become a way to say something useful and air some of my views about it. After the weekend I had heard from no one, but on Monday I was phoned by the Standard, which wondered if I would like to write letter to the paper, for publication on Tuesday. They hadn’t managed to get my request to Sewell or he hadn’t replied. He had been ill. He is 70 or more. So I did, and sent it in the evening. 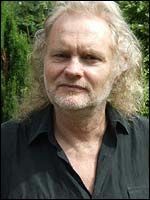 On Tuesday they phoned me again saying they would like to carry the story, as it was, in Sewell’s absence. —Which they did, on Wednesday. The rest is history, as they say. Williams: Is the sculpture now on display, in part or reunited with its head? Hensel: The RA did phone me after the Standard’s story, apologies and all that, but they had to ask the selecting artists for their opinion before they could do anything, again relying on experts, and on Friday they still hadn’t been able to get them in to decide, so they started insisting the plinth had been selected on it’s own. By that time I had seen that there would be more in this by keeping it empty, though I would be willing to reunite them if they insisted. Eventually they said both parts had been viewed separately and the head rejected. I imagine the head wouldn’t come across without a base to stand on, but I know these artists by their work which is very different from mine. Inevitably when selecting from thousands, snap decisions based on taste are made, and if it has presence it can get in. Just because it has presence doesn’t mean it is art: that needs to have something more. Though, I do think it works well in this empty version—and I wish I had thought of it myself! Would have saved a bit of work. An afternoon instead of two months, more if you count learning the new medium I wanted to use. 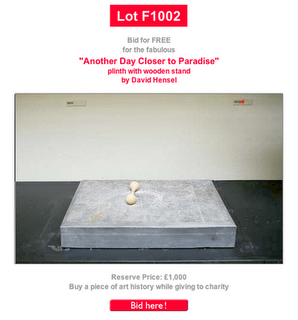 Now it is going to remain separate, just the plinth on show, and that suits the next development, which is that The Times is going to auction it as it is, accompanied by a documentation of the event so that it can be seen as a new work of art about the failed one. Williams: In general, what would you say the public reaction has been to the news of what has happened to you, as distinct, say, from the reaction of the media and the RA? A fair proportion of the people I know are artists in one way or another, and they all seem to be delighted, as though it’s a justified come-uppance. There’s a generally held sense that these people deserve it—not the RA really, they’re respected, but the charlatans. Many artists play to the market, but that’s only healthy greed. The cheering is nothing to do with the handling error that caused it, obviously. We all feel the embarrassment they undoubtedly feel. 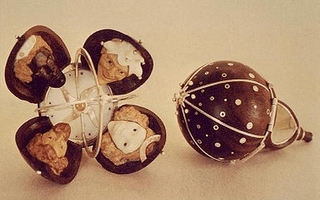 Williams: Had you ever submitted a sculpture to the RA Summer Exhibition before? I notice there is a piece on your website on a page referring to a previous Summer Exhibition, but it’s not clear whether that sculpture was accepted. It looks like an auto-fellating cherub. Hensel: Exactly right, that’s what it is. It was accepted for the 2003 exhibition. It was the first time I had submitted anything, so that was pleasing. I couldn’t find that when I went either, but it was there, just high up on a bracket on the wall, presumably out of respect for the old ladies. The title I gave it had reached the stage of ‘The Old Bush Award’, and I saw it as a design for a trophy which would be given annually some time in the future in the name of G.W. [Bush] to worthy world leaders. I had first called it ‘Jerusalem’, after Blake, honoring his wonderful song against the British Empire’s use of Christianity—hence the religious aspect. The foundry called it ‘Angel’s delight’. Later, I changed the title to ‘Fountain’ thinking of Duchamp’s urinal. Williams: I’d like to know how you describe our own work. You’re a jewellery maker and sculptor, making both indoor and outdoor pieces. Your jewellery appears to be more in the nature of ‘personal sculpture’: many of the pieces are very—how to put it?—visible. They would be hard to miss if someone were wearing them. Hensel: I once many years ago recognised I couldn’t happily call myself an artist because I didn’t know what art was, so I decided to try to come up with a new definition every day. It’s a useful discipline—keeps the intellect out of the creative process when working. I still don’t know, though, but recognise that the desire to categorise and label is what all artists are trying to subvert, to find ways to get under someone’s skin. So, yes, my jewellery is personal sculpture . I always liked whittling as a child, but that doesn’t make traditional ‘sculpture’ because decisions are made hand-held, not placed on a plinth where they can penetrate the ground and permeate by impersonation into the viewer. An inspiration in small sculpture was the way I like to find scraps of stuff that had presence, that looked as if they were something monumental, something huge and far away, or I was a giant looking at them. Anyway, it turned into jewellery as a way to have something saleable, and then it made sense to try to make more and more of the found items and to make them out of precious materials. I like finding out how to do the technical parts, getting better at making expressive carving, most of it has involved carving of some material or other—and especially I like the discovery that doing it as jewellery is a way to connect with certain people. I have to find new ways to work now. It’s getting so disagreeable to work on this tiny scale because of age-related eyesight problems; but also one needs to change because each kind of work supports it’s own kind of thought and I need to move on. Williams: I don’t want to get bogged down in questions of taste, but staying on question of how to describe your work for a moment, I certainly wouldn’t put you anywhere in the lineage of Brancusi. A lot of your work seems to have a highly stylised, ‘Druidistic’ look to it—possibly in the Blakean sense of the word, relating to a universal, non-Christian proto-religion. Is it something like that? Hensel: This has happened without any intention on my part. I didn’t study jewellery-making at art school. All my processes have been made up. I am not able to do the fashion thing, the up–to-date style, because you can only work from your own background, in my case rural English, and you can only work towards you own society. I don’t live in a stylistic stratosphere. I don’t design what I do in the way some people work—as adornment, as graphic design, using images and dynamic qualities from advertising, fashion, etc. What I want to do is to make the next thing, allow the fact of making some object, which has it’s own place in the world, to be a way of looking at the world, at people, at myself. I see this is basic to the way art works anyway, it’s a way of looking at the world, provides filters and templates which are the shape of your methods and skills. That people call it druid jewellery (and I was amused a while ago to discover an American agent of mine was calling it just that) is fine. We need to label things both to make them available as well as to protect ourselves from them. What I am most inspired by is being told—and it happens regularly—that what I’ve made for someone is their most beautiful possession. I think it works to make a personal, private mythology for the owner. Art can work in many ways. A piece of jewellery can be something to hide behind as well as to show off with. Jewellery particularly can be a social way of demonstrating mastery of some aspect of the world, your bank balance, your self image, your emotional depths, and it can be a way of holding in place questions that you need to discover or explore. Williams: I’ll be honest and admit that my instinctive, first reaction to your work was not positive—I thought it looked like a not completely integrated mash of visual styles and attitudes, including Druidism, pre-Raphaelite and Art Deco. However, as I looked through over a hundred works photographed and presented on a jewellers’ website, I began to sense a very strong imaginative impulse in your work that is both impressive and affecting. There are some smallish pieces, for example, that for the sake of a taxonomy have to be called ‘rings’, but in fact they are more like cabinets that can be ‘unfolded’ to reveal a secret interior design and subject matter. Is it correct to say that you (and your work processes) concentrate more on the imaginative work in creating your art than on resolving stylistic problems? Hensel: I think you are right. It’s relevant to think about what style means, how much it is a starting point determined by awareness of market fashions, how much it is a set of accepted constraints that represent your sense of where and how you live, within which your personal imagination can flower, how much is it a measure of the balance between your awareness and unawareness. That some people value that handmade quality of my work is possibly an indication that they feel deprived in their own lifestyle. That’s an important function of art: that all art has a bodily or personal purpose. Williams: I’m interested in what has happened to you from the point of view of ‘intentionality’. That is, is what artists mean important, even if we have difficulty getting access to what they mean? It strikes me that what has happened to you is an interesting example of how easy it has become to brush aside the intentions of artists, as though it were both theoretically and personally unimportant what you meant or wanted. I also think it’s interesting that it was, possibly, not an artist or curator that came up with some of the (what seem to me) insulting remarks from the RA, but a publicity spokesperson. Maybe we’ll never know for certain. Of course, the other side of this situation is that you appear to have been quite open to the comic and creative possibilities of the moment, so that what seemed to be an insult has been turned into a conversation about what art is. This says a lot about you as a person and as an artist, though how anyone could separate the two, I don’t know. Hensel: I don’t think you can separate them. One of the long-term processes is the integration of the art and the person. One of the skills in any creative process is knowing how to respond to chance. I just applied that in the real life situation. It wasn’t difficult to agree to the new form of the sculpture, and I will learn from that. If something is stuck, you try to reverse it, and thinking how to reverse the possible insult took a while. I cheered on reading Brian Sewell’s scathing article about the Summer Exhibition, because I read it returning from going to the preview, where I’d hoped to find my own sculpture. Instead what I found was the empty base, without the sculpture. We know the art market prefers obscure art as somehow more advanced, and anything can be aesthetic if presented well, but selecting an empty plinth seemed to typify the vacuity of a lot of the work in the exhibition. However, one important way the art world functions is that it is in itself a satirical, staged, cultural performance, a parody of the pretentiousness and hypocrisy of our government, our commercial pressures and their propaganda (sorry, public relations and advertising), with their approach of making us feel inadequate so we’ll go out do more shopping and vote for greater protection. To be effective, propaganda must be invisible, must reduce awareness, and thus selecting an empty plinth could be a taken as a warning. The conscious intention of the artist, the subject’s story, is only a part of what will go into the work of sculpture. 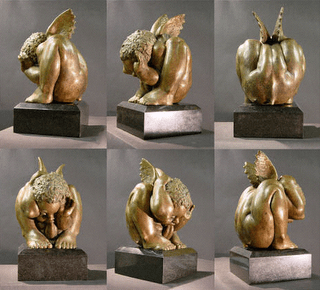 A sculpture can work by choreographing spectator motion, holding out new gesture or stance, which carries attitude or expectation towards new perception. Brancusi was important in clarifying the function of the plinth, which reaches down to the ground, so the sculpture can penetrate through and up into the spectator, hopefully catching and moving them before the intellect is stirred to ‘interpret’. People often go round an exhibition and at then end find the world looks different. The refinement of a work involves working with these factors. It’s an important part of presence, and the various forms of abstract have been explorations of this. The idea the artist uses—the meaning or subject—are vital for keeping the work process in focus, but because the end result is going to act through different sense channels, this subject can dissolve as the work progresses. One wants to arrive at a resolution where all conceivable aspects that the spectator might perceive have been considered, seen. The aesthetic balance of all these aspects can mean some aspects are reduced to mere hints and suggestions, and include not just the usual sculptural aspects of awareness of volume, forces, scale, etc., but a respect for the likely familiarities of an audience. The artist’s intentions evolve as potentials unfold. I feel comfortable with this: I see a subject as a question. One can only work from one’s own background and speak to one’s own society; and any work of art is at some level an attempt to discover more about these. The question is a vehicle used to arrive at something special, something which holds a focussed awareness of life in place, and this only has value if it has a presence for others. This is quite difficult in our time where we have a very sophisticated ability to find meaning in anything has that quality, where we can project meaning and then believe we have found it. The challenge for the artist is to try to rise above this. I feel lucky that the ‘new’ version matched beautifully with my original subject. All I have done now is to see this and accept it. Back-tracking a little—I don’t feel it is correct to say I make Druidic jewellery. I had never heard this term, until about 1990, when it was used to describe my work by an American agent. Now, apparently, I make Gothic jewellery as well—when what is really meant by that label is that I make some pieces that might appeal to a segment of the market called ‘Gothic’! These terms just are not within my conscious awareness. In my own perception, my work is ‘handmade’. Societies and tastes change. One adapts to new markets as far as one’s constitution will permit. Labels are presumptive. I recognise some of the influences you mention. The work of an artist is to explore the invisible within themselves, as a prelude to engaging with something more socially conscious. One of the primary urges of the artist is to be up to date—a responsibility as well as for fun—to keep the wave-front of consciousness free of opportunism and bias. I feel this mistake in the RA, the one we have been discussing, means they are not paying attention. Williams: Did we rush to conclude that the person and the artist were inseparable? I remember my feelings of outrage whenever an academic industry develops to point out the political and other defects of an artist who, for one reason or another, has become a target. Virginia Woolf, for example, whose diaries occasionally show her to have been class-prejudiced in a very mean and blinkered way. Artists, though, are often on their best behavior in the act of creation, where an empathic impulse drives the work towards universality. Can we agree on that? Hensel: This is an interesting question. I think you could say that the artist and the person are inseparable in the same way as an actor and his character are inseparable when he is committed to playing his role for life. Rather than “best behavior”, I would say honest behavior. I feel that the artists who become significant are on one hand the people who reveal in their own awareness, background and obsessions a correspondence with a broader cultural awareness, who are able intuitively or knowingly to explore within themselves and through their technical skills questions that are relevant to others, and by that means to come up with the questions that need to be asked; and, on the other hand, those who manage to make the most eye-watering expressions of being alive. It depends who you work for, though, and what sort of status symbols or control devices they pay you to animate. Some art commentary tends to blur the relevance, trying to invent and impose their own significance, trying to be seen as interpreter and exponent of desirable taste, and probably being paid to obscure uncomfortable questions. Similarly, historians devise art movements in retrospect, imagining influences, connections and interactions that often seem to confuse, for example, there’s synthetic internationalism, or a demand to be post-modern, labels which I see as divisive, separating an artist from their own native background and natural audience, from their own intuitive engagement with their time and place, which can result in an artificial—although evidently profitable—quality of imitation and fashion. It’s only through the many stages of working that one can arrive at an expanded sense of universality within oneself. The actual work of an artist is finding what their work is, what their genuine concerns are, shedding adopted influences and assumptions and becoming able to reveal the self as universal, and this is a process that that can be personally agonising, time consuming and difficult. I want to convey the idea that there’s a sense of responsibility that defines the artist, and I think it’s the artist in each of us who can recognise and respect breath-taking cultural achievements as responsible opportunism. ‘Culture’ is more than party time for the arty: it’s a shared creation of where and how we live. I know this whole event has been hugely amusing. —Punctured dignity often is. But, looking at the discussions about art, in the press and on the Internet, it’s clear there’s a lot of thought about it. I’m hoping that the interest can persist for long enough for the questioning to turn to why it’s like it is, not so that we get better art—it’s perfect as it is, in that it reveals negative sides to our nature—but so that we can understand a little more clearly how the world works and how the arts reveal that. And I think that’s something we agree is necessary. Continue reading "Michelle Ramin | in real life"
Victoria Contreras Flores | correspondence - Victoria Contreras Flores received her degree and PhD from the Polytechnic University of Valencia. She was born and lives in Valencia, Spain, and is the creator of ARTNATOMY, and a great variety of other artistic projects. Santiago Cañón Valencia | interview - Santiago Cañón Valencia is a cellist. An emerging solo artist of great technical brilliance, he was born in Bogotá, Colombia, completed his bachelor degree with James Tennant at the University of Waikato in New Zealand and advanced studies with Andrés Díaz at the Southern Methodist University in Dallas. Winner of many awards, he has performed with orchestras in Colombia, Australia, New Zealand, the USA, Canada, and Hungary. Continue reading "David Hensel | interview"
Continue reading "Victoria Contreras Flores | Art~natomist"